Maxine Vallance Service Details - Whitby, Ontario | Barnes Memorial Funeral Home Ltd.
always brighten our hearts & be remembered. It is with peaceful hearts that we say goodbye to Maxine of Brooklin Ontario. Predeceased by her husband, best friend & business partner of 56 years Don Vallance. Cherished mother of Scott Vallance (Angela), Bev & Joe (Palmieri), grandchildren Candace (Justin), Ryan, Caitlin (Matt) Nicholas (Selena). She was anticipating the title of great grandma Max with the arrival of twin grandsons in 2019. Much loved sister in law & friend of Dr. Jan Vallance of Oshawa and Lois Speiran of Moncton NB. She was Auntie Max to her 8 Speiran “boys” and Aunt Maxine to her Vallance nieces & nephew and their families. They all had a very special place in her heart. Predeceased by her parents William & Florence Speiran, her brothers Elston & Vernon Speiran, and by loving daughter-in-law Cathy Vallance. Maxine had a great sense of community and abundance of friends. 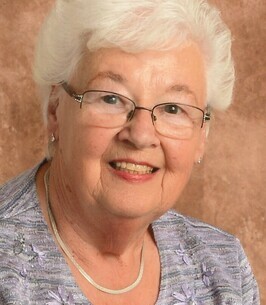 She was a loyal member of the Brooklin United Church, the choir and the UCW. She was always called upon to “make the gravy” for the annual Beef Dinner as well as her delicious pies. She enjoyed playing bridge with the “Brooklin Ladies” for over 50 years and in later years travelling with them. In her heart Maxine was always a “Farm Girl”. She will be remembered as a gracious hostess, her generosity of spirit, love of family, friends and the cutest dachshund dogs. The family extends sincere thanks to Dr. Westmore & Dr Viera and the excellent care given by the nurses and staff of Lakeridge Health Oshawa. Visitation at Barnes Memorial Funeral Home, 5295 Thickson Rd. N. Whitby on Sunday October 28th, from 1:00 p.m. until time of service in the Barnes Chapel Sunday afternoon at 2:00 p.m. In lieu of flowers donations can be made to the Brooklin United Church or Canadian Cancer Society. We encourage you to share any memorable photos or stories about Maxine. All tributes placed on and purchased through this memorial website will remain on in perpetuity for future generations. Our sincere condolences to Scott, Bev and Family Sorry to hear of Maxine's passing. She was a real force in your family and a credit to her community. Her dedication, volunteer efforts and lifestyle in general were examples of a life well lived. She will be remembered for her wide smile her friendship and her unwavering contributions. My condolences to Maxine's family. I frequently walked my dog past her home and often shared her smile and a little chat about dogs. She and Don were such a long-time neighbors. She will be missed.